He’s back… and he’s been quite the challenge to “manage” while we’ve been working through the Great Altoids Gift Challenges. Here’s what he’s been up to this year — from my newspaper column. We can freely debate the existence of Santa in our house — but when it comes to Elf, there is no discussion. Out of all of the make-believe characters that are introduced to children, Elf is the only one that truly helps me. For example, I’ve found him standing guard in front of the Kitchen Aid Mixer, preventing me from creating a icing-massed disaster with my over-zealous dream of a Martha Stewart gingerbread house. Some days, in the throes of the holiday hustle and bustle, Elf is the only one who remembers to move the marker on our Advent Calendar. More importantly, when the stress level is too high, he’s the one who pulls out the karaoke machine and gets us singing to yet another verse of We Wish You a Merry Christmas. And thoughtfully, Elf mixes the reindeer food in advance, so that we’re ready. 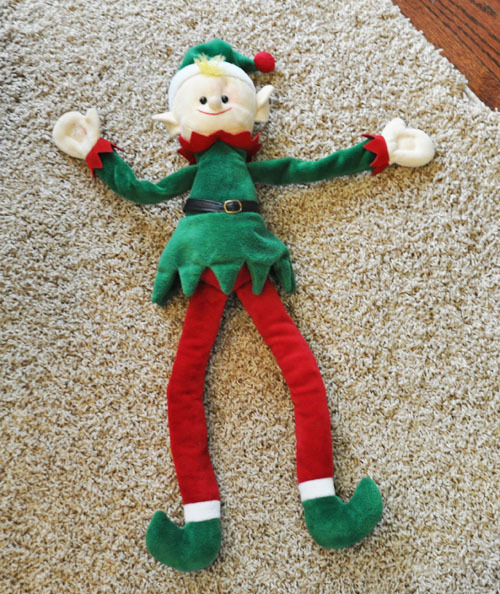 I’ve warned my family not to have any discussions that even hint at the possibility that Elf is nothing but velour and stuffing. If Elf ever heard us talking like that, he would leave for sure. Except for this year. Elf has been making his mischievous side a bit more apparent. His antics go beyond the snowball fights he organizes with the other stuffed toys in the house, (the one that involves mini-marshallows). I’m talking about that one particular morning we found he had made snow angels. On the counter. With flour. The next morning, the boys woke up to find their room had been “toilet papered.” Elf was found sitting in the corner of the room with the empty toilet paper roll dangling from his velour-stuffed arm. Elf loads the TiVo with Christmas specials, leaving no memory space for our own shows. And Elf is always the one who leaves the Legos lying all over the floor — it’s never the boys, so they tell me. We came home just in time one night, to catch Elf sneaking the tape off the wrapped presents under the tree. And, don’t even ask us about what is up with our Christmas lights — Elf messes up the timers on the lights so that the lights are on during the day, and off in the evening. Sadly, there are even teeth marks on the gingerbread ornaments dangling from the tree — from very small teeth. One morning, Elf made the boys late for school. They had trouble scrubbing off the single red dot that Elf had painted on their noses while they were sleeping. I like your elf and his mischief. My elf is not of the shelf variety and does not report to Santa. He’s a house elf in red and green. And he’s a bit quieter. He likes to play hide and seek on Fridays. But I think, when we finally get some decent snow around here, he will be so overjoyed he’ll start a snowball fight and make snow angels. And maybe swipe the American Girl doll’s sled and ice skates for a little fun.